PLANNING MEETING – We will be planning our activities for the new year. Please come with ideas and a willingness to share. If there is time at the meeting we will make a pine cone feeder for our feathered friends with peanut butter and seeds. $65 per person includes: Comfortable coach transportation, a guided tour of the Orchid Show, independent time for lunch and the gift shop, a stop at Arthur Avenue for gourmet shopping. For reservations please call (845) 615-3828. Payment must be received by April 4th. Bus will leave at 8:00am from the old OC Government Center in Goshen and return by approximately 6:00pm. PROPER NUTRITION AND AVOIDING BACK PAIN AND MUSCLE STRAIN WHILE GARDENING – We are fortunate to have Wayne rossi, DP, PC from Chiropractic Health Center in Warwick, NY as our guest speaker. Dr. Rossi has been a chiropractor for over thirty years. He is a certified sports practitioner and possesses an MS in Clinical Nutrition. Meet at Smith's Clove Park for a tree planting event. Volunteers needed! Meet at the Orange County Arboretum for an opportunity to purchase plants as well as to contribute your thoughts. St. Paul's Lutheran Church, 21 Still Road from 9am to 3pm. Annuals, Perennials, Herbs, Container Gardens. We will be selling plants that are deer-resistant and locally grown. 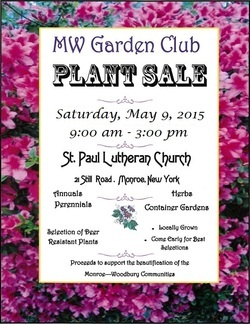 Proceeds to support the beautification of the Monroe-Woodbury communities. We encourage you to come early for the best selections!